About the DPW Challenge! | Get the Widget! or click here to quickly register. A very kind challenge fairy offered me the idea for this month's challenge: painting in a low key. According to Wikipedia, a painting is considered low key "if its dominant values are black, dark brown or dark blue." My own personal definition is just: contains more dark values than mids or lights. Imagine that after you created the work, you cut it up into a bunch of little pieces. Then you put all the dark values in one pile, the mids in another, and the lights in another. Is dark the biggest pile? Then it's low-key! 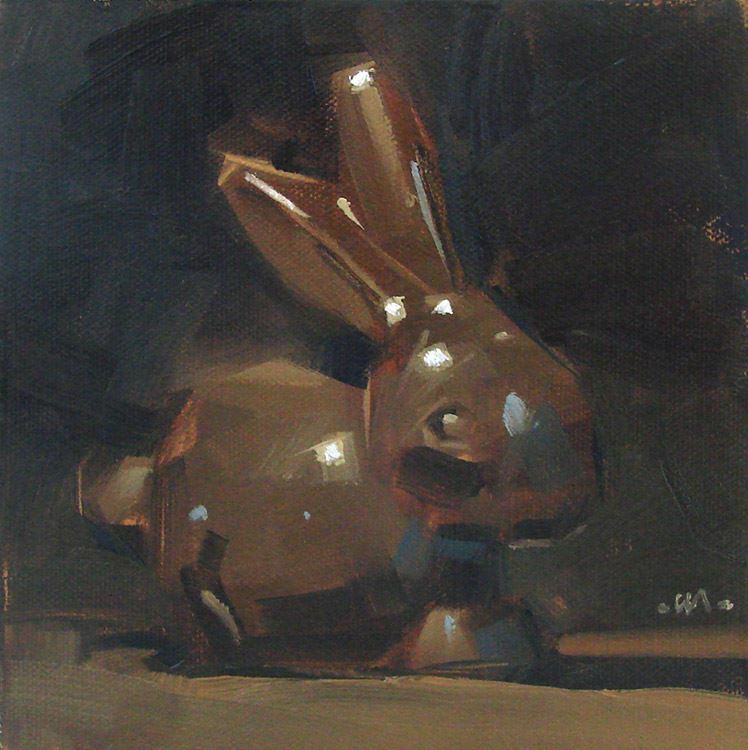 The example is an old painting of mine, where I painted a dark bunny against a dark background. You might also consider a nocturne, a scene dominated by shadow, etc. Have fun! or click here to register (it is quick and free). All payments for winning bids will be made through PayPal directly into the artist's PayPal account. You do not have to have a PayPal account to pay for artwork. PayPal offers the option to pay instead with a credit card. To view and bid in the auction of any painting in this Fundraising Challenge, simply click on the painting's thumbnail, and then click the Bid in the DPW Auction link in the popup that opens. Each participating artist has agreed to donate 100% of the proceeds of the sale, minus the shipping costs. Details on how your payment will be donated can be found in each painting's description on the painting's auction page. If it is not, please feel free to contact the artist by clicking the Email the Artist link on the painting's auction page. Any tax benefit from the donation goes to the artist, since they are making the donation. While DPW manages the fundraiser and the auctions, the actual purchase is directly between you and the artist. If you are the winning bidder at the end of an auction, you will receive an email with instructions on how to pay the artist by PayPal. You can also go to your my Auctions page and click the PayPal button to pay. DPW will charge no fees in this fundraiser, however PayPal will charge the artist their normal processing fee. Thank you for your kind patronage and generosity. Submitting to a DPW Challenge is quick and easy. There are no deadlines, and you can submit to any challenge as many times as you want. All entries must comply with the letter and the spirit of the challenge and must have been painted after the challenge's posting date. When you click the Submit to the Challenge! link on the challenge page, simply fill out the dialog form that appears. After a quick spam screening, your submission will be posted on this page and available for other artists and potential buyers to see. Best of all, you don't have to sign up for anything and there are no fees or commissions. Please be sure to follow the spirit and the letter of the challenge. For example, each submission must be painted after the challenge is posted.